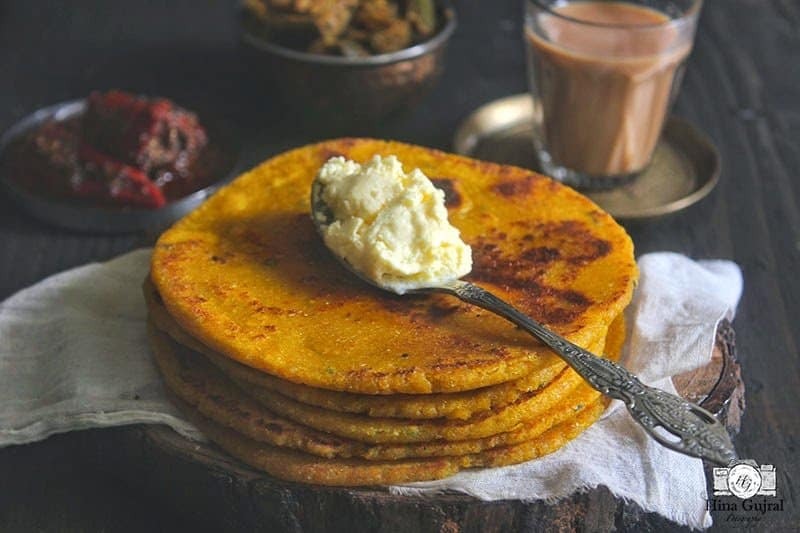 Makki Aur Aloo ka Paratha is an Indian flatbread made with maize flour and spicy potato dough, the boiled potato is seasoned with various spices and then rubbed with maize flour to form smooth pliable dough to make Parathas. 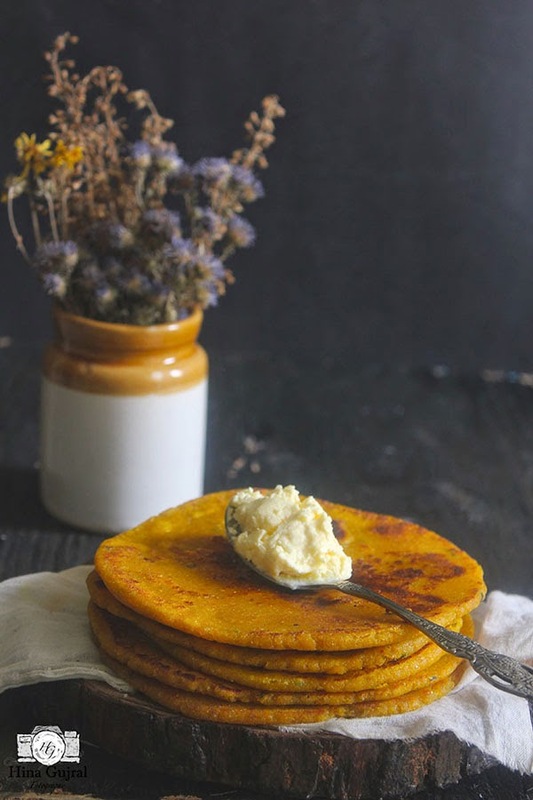 While the winter is slowly slipping from the seasonal calendar, in Southern India, it is still hard to resist not to make wintertime delicacies for the one last time until the next season of warm winter sun, misty air and chilly winter breeze. Few weeks back I made Sarson ka Saag with Makki ki Roti (see recipe here) that left me with few cups of maize flour lying in one unattended corner of the kitchen shelf and pleading to be used soon. While I was planning for the Makki ka Paratha there arrive the Asus Zenfone 5 project, to share my experience of the smartphone as a food blogger. After exploring for hours different features of the new found gadget the idea of video recipe was suggested by “His Genius”, who agreed to help me with the video in turn of homemade butter laced Makki or Aloo ka Paratha with Lal Mirch Ka Achaar (see recipe here) and a cup of strong Masala Chai. And then there was rolling, camera, action…..
With some initial stumbling steps, we both managed to sail through the process of video making not only with flying colours but also without apprehensions. The ZenFone 5 sports an 8-megapixel autofocus rear camera with a f/2.0 aperture lens and LED flash. There is also a 2-megapixel front camera. The video is shot in the natural light without using any flash so I guess that explains the HDR quality of the camera. Then to make the video making much easier for beginners like me there is an inbuilt application in Zenfone 5 Movie Studio, where video editing can be done in a hassle-free manner. Here is my first Video Recipe made using Asus Zenfone 5…. 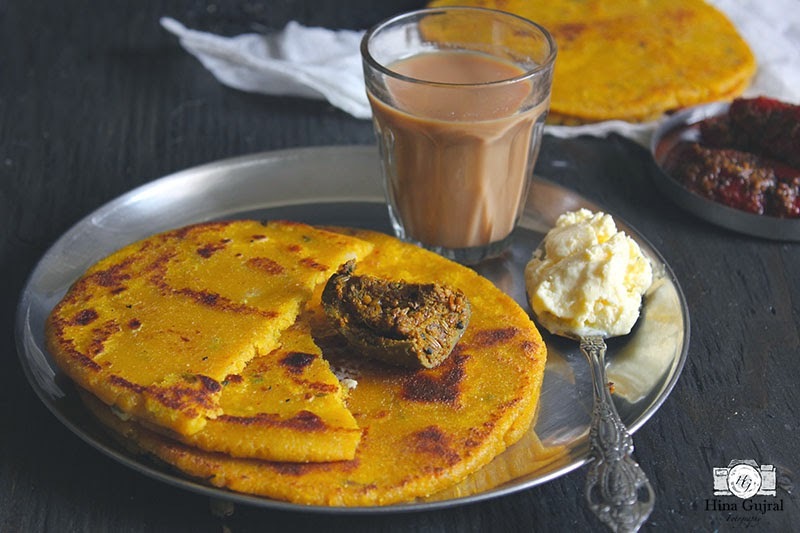 Makki Aur Aloo ka Paratha is an Indian flatbread made with maize flour and spicy potato dough. 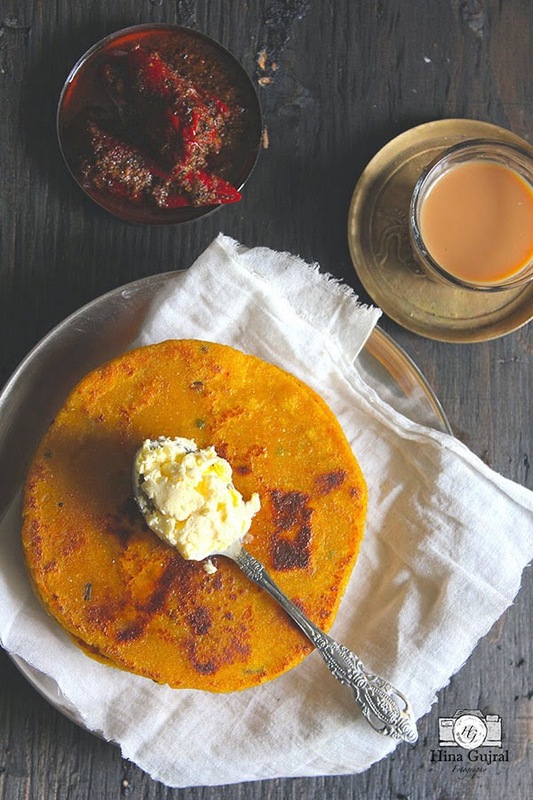 Learn how to make makki aloo ka paratha in few simple steps. To make potato masala, grate boiled potatoes in a bowl. Add in salt and spices. Mix with fingers to combine the seasoning evenly. To bind dough for the bread, sift flour together in a bowl. Add salt, red chili powder, potato masala and 2 tbsp of oil. Combine the mixture with fingers to get bread crumbs like texture. Using little water at a time bind soft dough. Knead the dough for 2 – 3 minutes. Grease dough with little oil cover with a kitchen towel and let rest for 10 minutes. Meanwhile heat non stick skillet over medium heat. Line kitchen counter surface with a clean dry plastic sheet. Grease it with 1 tsp of oil. Pinch a portion of dough and roll into a ball and then flatten the dough ball using fingers. Place the flatten dough ball over the plastic sheet and cover with another plastic sheet. With a rolling pin roll out the dough ball to medium size roti of approximately 3 inch diameter. Now slowly transfer the paratha from plastic sheet to your palm. Greasing plastic sheet beforehand makes this step easier. Place the paratha from your palm to heated skillet and cook on both sides. Spread 1 tsp of oil on one side and flip the paratha grease another side as well with oil. Cook paratha on both sides until nice and golden. Transfer paratha to a serving plate. 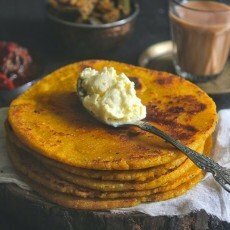 Serve Makki aur Aloo ka Paratha warm with Homemade Butter. Nice Recipe, good pic quality, I am planing to buy new phone, amazing pic quality. Absolutely lovely! Made it, came out perfectly crisp and yum! I am so happy you like it!